The small apartment 4 with 2 bedrooms can be booked up to 4 people. It is located on the ground floor in holiday home No. 137 B. You then come to another 200 m directly on the market square. A fully equipped kitchenette with dining area is available in the living room. You also have a small balcony in the apartment. The living room offers enough space for 4 people. Apartment Harz 3 in Wernigerode, near the historic old town of Wernigerode with its half-timbered houses. The apartment 3 is suitable for 6 persons. From here you can reach the center with the market square and the train station of the Brockenbahn in 5 minutes. 2 parking spaces available and already included in the rental price. To the castle Wernigerode small trains go from the market square. You have to pay a visitor's tax in Wernigerode, but so you have a free bus use throughout the Harz district included. Shops are right next door. 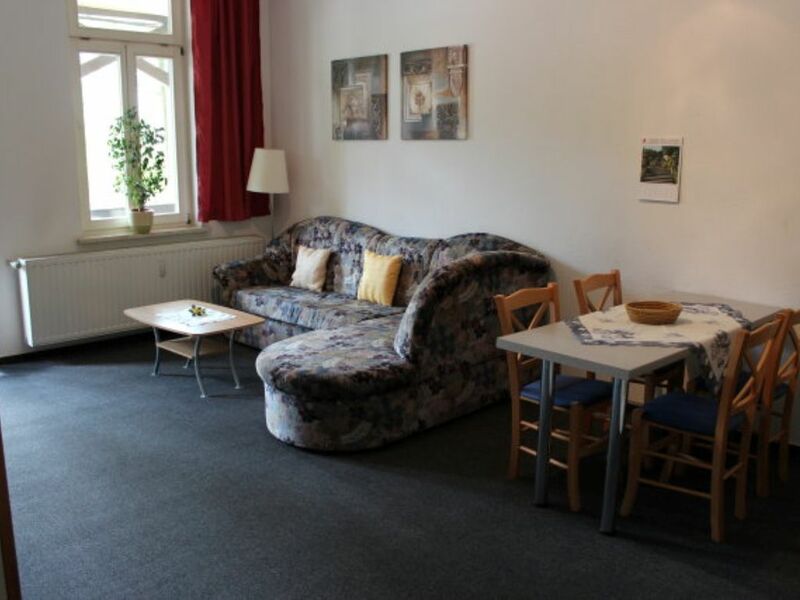 You can also reach nFerienwohnung 3 by city bus. You can get on line 1 at the train station and get off at the Kindergarten stop. There is then also our apartment.